with impressive all-steel durability to ensure every task goes off without a hitch. adventure without being held back by bulk. - Has no plastic parts; made using all steel. - The high-carbon triangular handle provides added comfort. - Has a powder coat finish for striking aesthetics. - The nylon pouch comes with gear loops for easy carrying. - Backed by a no-hassle 100% money-back guarantee. Click 'Add to Cart' now to experience enhanced durability and versatility completely risk-free! - 1 TOOL; 4 USES: Get more done with just one entrenching tool. 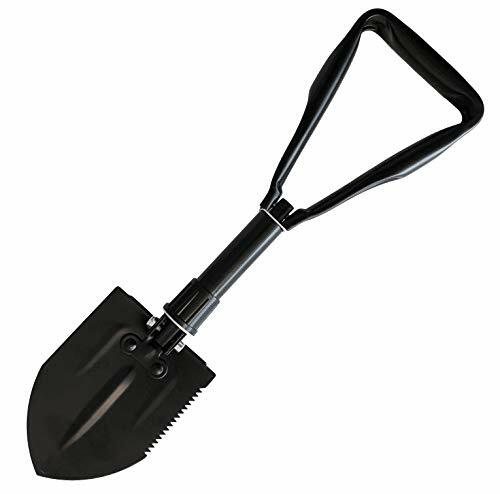 This portable folding shovel can be used as a spade or cutting tool, rotated to reveal a pick, or function as a hoe. Take it during your next camping, hiking, or backpacking trip and experience survival versatility at its finest. - DESIGNED TO LAST: No dealing with flimsy plastic parts. The Typhon East military-inspired folding camp shovel is made using all-steel for enhanced durability. Have the freedom to do everything from shovel snow, dig latrines, to tend to your garden with impressive reliability. - COMPACT AND LIGHTWEIGHT: While other collapsible e-tool shovels still take up a lot of space, we've designed ours with a tri-folding design that takes the entrenching tool from 18.25" to just 8". This multitool foldable shovel also tips the scale at a light 24.5oz. - BONUS NYLON CASE: Carrying your army folding shovel couldn't be easier. We've included a nylon carry pouch complete with gear loops for hassle-free portability and neat storage. You'll also love the high-carbon handle that ensures heightened comfort and increased toughness. - 100% MONEY-BACK GUARANTEE: At Typhon East, we believe in old-fashioned service and quality. If you are dissatisfied with your multipurpose trenching shovel in any way, please reach out to us and we'll issue a full refund. Click 'Add to Cart' now to get quality outdoor essentials 100% risk-free! If you have any questions about this product by Typhon East, contact us by completing and submitting the form below. If you are looking for a specif part number, please include it with your message. Otplore Military Folding Tactical Shovel - Multitool Shovel for Camping Backpacking Hiking Car Snow - Portable, Multifunctional, Compact Emergency Kit, Heavy Duty Survival Gear, 32"